While the names and exact rules differ, playground games are universal. They have simple rules and often need no props other than what can be found nearby. Many of them have no ultimate winner or goal, only a succession of victors and an end brought about by exhaustion or fleeting attention spans. Others, such as "Ring Around the Rosie," have no conflict or dynamic rule-set at all, resembling ritual more than game. Of course, given the history of adult games, ritual and game aren't always separate. Where do these children's playground games come from? What was their purpose and place within the culture, and how did they impact a young developing mind's view of the larger world? We begin our speculative journey at the dawn of humankind. The lives of prehistoric, pre-civilization humans were fraught with peril at every turn. Like the animals with which they competed for resources, family survival was not merely a fulltime job, it was an all-encompassing vocation in which everyone had to participate. It is difficult to imagine, then, that cave-dwelling human children would have had time for games. Yet, as evidenced by the over 2,000 cave paintings at Lascaux, they certainly had time for art. These, if nothing else, prove that something separated the Cro-Magnons from the animals. The drive to recreate the world in symbolic form seems to be uniquely human. We are filled with a desire to communicate our perceptions of the world via language and art. Sociologists, anthropologists and psychologists use a variety of terms for this difference, but I like to call it imagination. 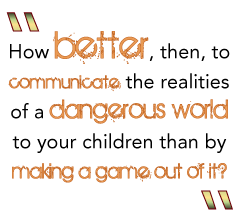 How better, then, to communicate the realities of a dangerous world to your children than by making a game out of it? Language was likely not very developed at this point, so the games would need to be simple, and, as the dangers were more physical than cerebral, challenge the youngsters' strength and agility. Being alert and ready to flee predators would have been at the top of the list of necessary survival skills for all children. This would have given rise to any number of games with a predatory angle - tag and hide and seek being the two most prominent examples. Variations of these two basic games are reflected across every culture, from the Japanese "Mr. Daruma Fell Down," to the Saudi Arabian "The Hunter," to the Inuit "Amaruujaq."